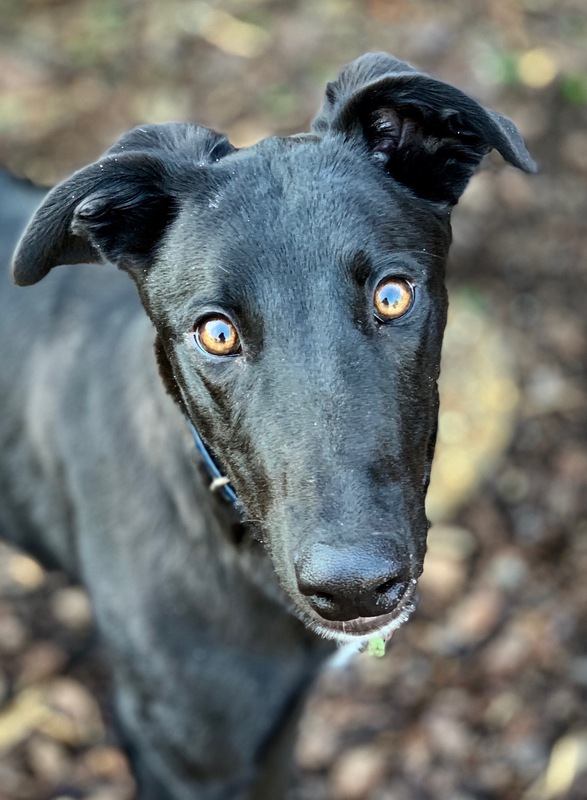 Paragraph is a black male greyhound puppy that is only 5 months old. He was born on October 1st. He came in with his sister Yolo Paradise. His sire is Fiesta Paraguas and his dam is Bella Fuitzy. His owner just decided not to race some of the puppies in his litter and put them in pet homes instead. Probably as a result of Florida voting to stop racing as of the beginning of 2021- right when these pups would be going to the track to race. Greyhound puppies are expensive to raise properly and with over half the tracks in the country in Florida closing there will be a shortage of tracks for these pups to race at by the time they are old enough. Paragraph is a friendly, hyper puppy that is going to be a handful. He has not been leash or collar trained, has no house training or manners training at all yet but we are working on that. He was raised on a farm and has never been in a house or had the track training that the typical retired racers have. He has been living at the Birmingham Race Course adoption kennel for a couple of weeks so has had some crate training there. Paragraph is wild, hyper and playful like any other puppy, but he weighs around 50lbs and will be around 70lbs in a few months. Greyhound puppies are not the calm couch potatoes like the adults we are used to. Puppies need to run and play most of the day and need a lot of training, socialization and work on manners. They need plenty of room to run in a large fenced yard. Paragraph will need a home that has dog and puppy experience. Because of his size and rough play we would prefer to place him in a home with older children or no children. He would accidentally knock down a toddler in his excitement even though he wouldn't hurt a child on purpose. Paragraph is a very sensitive guy that gets overwhelmed and scared easily. After a week he still isn't liking wearing a collar and still shies away from hands that reach for his collar. He still freezes on leash and doesn't want to walk. He seems like new things bother him and that it takes him a long time to process change. He is a very sweet boy that wants petting and love but is a bit on the timid side at the same time. He will still come up to new people and jump on them and act crazy when the other puppies do, but is a bit more timid by himself.